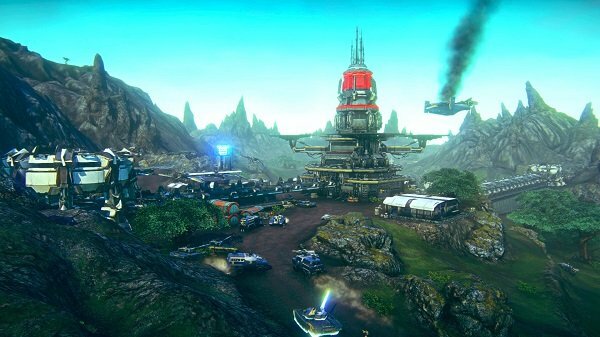 In PlanetSide 2, players take on the role of a single cog in a massive, complex war machine. And once you put in the time to become familiar with all of those various machinations and understand how they make that engine run, you’re rewarded with an exciting, genuinely satisfying shooting experience. It should be stated from the onset that PlanetSide 2 is a terrible first date. After my first evening playing this free-to-play shooter on the PlayStation 4, I remember thinking to myself that I wasn’t really having a good time. I was dropped straight into the fray with almost zero explanation, the menus and HUD were a complete mystery and, for that first evening, I couldn’t even figure out how to throw a grenade (Tap L1 and R1 at the same time, in case you’re curious). To make matters worse, no matter how much I tweaked the sensitivity, I couldn’t get the aiming to feel natural. The following evening was a completely different story, however. While I felt overwhelmed by everything my first evening on PlanetSide 2, I went into my second play session less worried about getting directly into the fray and gave myself a bit of time to actually explore the game world and figure things out. It’s unfortunate that a legitimate tutorial isn’t provided to take care of that process for new players, but pretty much all of my issues were washed away after half an hour spent away from combat. When you first boot up the game, you’ll pick one of three factions and be dropped directly onto the continent of Koltyr. This is considered the noob-friendly map; much smaller in scale and direct in objectives. No matter which faction you choose, you’ll first spawn at a base that’s protected by a giant forcefield. Without the threat of enemies invading, I took the time to dive into all of the menus, check out the various control schemes and interact with the in-game consoles. A word of warning: There’s a console in the middle of your spawn room that lets you instantly teleport to one of PS2’s four other continents. Those other areas are bigger, badder and full of far more experienced players. You’ll be removed from Koltyr automatically at level 15, so I suggest staying in this familiar environment until you’ve unlocked some new gear and vehicles and stand a better chance on the front lines. Now that I had a better understanding of the game’s various systems, it was time to jump into the action. While the actual shooting still isn’t on par with your Destinys and Battlefields of the world, I finally managed to dial in the sensitivity to a speed that felt close enough to count. Once I was actually hitting what I was aiming at, PlanetSide 2 and I finally clicked. To expand upon that bad first date example from earlier, it was like the game suddenly informed me that it was a big fan of Stephen King and our conversation suddenly went from dull as hell to a fast-paced, deep discussion of our favorite moments from The Stand. 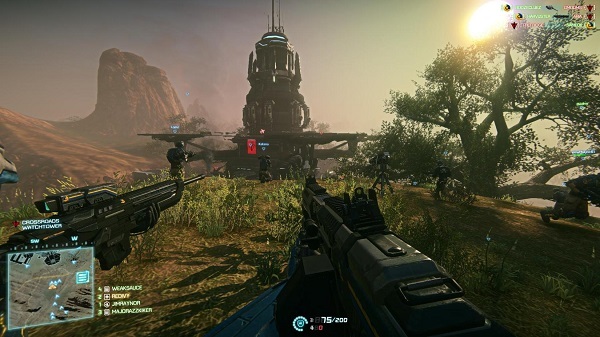 A class-based shooter, PlanetSide 2 offers a little something for every type of commando. Or, if you’re like me and don’t tend to stick to any one job type for too long, you can easily switch between the six classes. Want to cruise around with a jetpack and serve as straight offensive? You can do that. Prefer to go semi-invisible and snipe enemies from afar? PlanetSide has you covered. Prefer to stay behind cover while repairing equipment or dishing out extra health for your allies? You can do that, too. One night, I spent a good half hour just sitting on a mounted turret, blasting enemies foolish enough to try to invade our base while I sat watching. It was a nice, low key change of pace and was oddly cathartic. That variety bleeds over into the vehicles, too, including light and fast ATVs, slow-rolling vans that transport troops and serve as mobile spawn points, snappy tanks and even a bunch of air support. Just like with controlling the character themselves, I recommend you jump into the menu and check out the commands for each vehicle before hitting the road. The main thrust of PlanetSide 2 is gaining and controlling various bases peppered throughout the map, with three factions and literally hundreds of players in a constant struggle for superiority. It’s an interesting tug-of-war that might see you working all night just to claim an outpost and, the next time you boot up the game, you may discover that your teammates have lost that hard-earned location in your absence. On the flip side, you’ll get an extra surge of encouragement when you load up the map and see that your efforts have allowed the team to push even further ahead, practically dominating the entire map in your team’s color. Along the way, you’ll earn in-game currency that can be spent on everything from new weaponry and attachments to new gear for your vehicle. Most of the classes can also have their various abilities upgraded, too. There are a lot of areas you can dump your slowly-earned points into or, this being a free-to-play game, you can also drop a few dollars here and there to speed up the process. The nice thing is that it looks like everything in PS2 can be purchased with the in-game currency, and all of your starting gear is solid. What this all boils down to is a pretty fantastic shooter that’s well worth the effort for those willing to push through a rough couple of hours to understand PlanetSide 2’s ins and outs. More importantly, and unlike many other free-to-play games, it fills a void in its respective genre that isn’t already occupied by other for-pay titles. Nowhere else will you find this kind of scale, where a quiet stroll across the desert can eventually end in an all-out battle at an enemy-controlled base. That type of emergent gameplay is actually one of my favorite things about PlanetSide 2. Conflicts pop up all over the place, ranging from epic wars at bases and outposts, to smaller skirmishes spread across the map. If an enemy faction discovers where your mobile spawn vehicle is, you better believe a shootout is going to take place. They’ll probably roll in a transport of their own, and suddenly you’ve got 15 guys and gals on each team fighting to take out the other side’s mobile base. And I can’t tell you how many times I’ve been in a practically deserted outpost when, suddenly, everyone decides that’s where the action should be. Next thing you know, three huge armies are converging on an area that, just moments before, was utterly quiet. So, yes, PlanteSide 2 has some issues. It’s needlessly obtuse at times and super unfriendly to new players. But there’s a big, exciting game waiting for players willing to stick with it, making it one of those rare free-to-play games I actually plan to keep in the rotation.